Until mid-April, almost six months ago, the performances of the British, Dutch, Ukrainian and American intelligence agencies in producing evidence to explain the downing of Malaysian Airlines MH17 and the poisoning of Sergei and Yulia Skripal in Salisbury were about equal in fabrication quality and standard of proof; equally poor. The four services had no need to use espionage tools or hack into the Netherlands-based organs investigating the missile attack and the poisoning. That is because their agents walked through the front doors of the Dutch Safety Board (DSB), the Joint Investigation Team (JIT), and the Organization for the Prohibition of Chemical Weapons (OPCW); took seats at their internal proceedings; and were given unrestricted access to their files. The agents of the four services also dictated the findings which have been published by the DSB, JIT, and OPCW; they have jointly agreed to withhold release of material evidence. It has taken much longer for investigations by British, Dutch and other independent researchers to prove their fabrications and disinformation. The Russian contribution to this effort has been positive, though delayed, incomplete and contradictory, in the MH17 case; it has been negative in the Skripal case. Then on April 13, four Russians were arrested in The Hague, the Dutch capital, in circumstances and on evidence suggesting they and their alleged employer, the Main Directorate of the General Staff (GRU), were attempting to spy on the OPCW by electronic means. Official disclosure of what they were doing was delayed for six months until this Thursday. The exposed Russian operation threatens to compromise the veracity of much of the independent investigations of the MH17 and Skripal cases. How could the four middle-aged operatives and their superiors at GRU have miscalculated the risks and costs of being caught, as compared to their estimate of the gains of their OPCW operation, if they had got clean away? 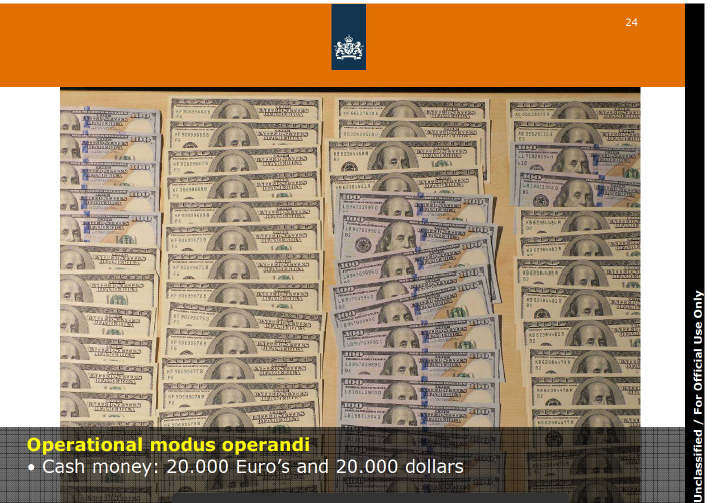 One clue to the answer can be found at page 24 of the Dutch military intelligence dossier, titled “operational modus operandi”. In the baggage of the four Russians were two wads of unspent cash — €20,000 and $20,000. Details of the failed Russian operation in The Hague and the successful counter-intelligence operation by the Dutch, have been summarised in the western media. For evidence on which the media have relied, there is this 41-page US grand jury indictment with detailed allegations of names and operations going back to late 2014, click to open. For the Dutch operation at OPCW last April, there is this 34-page folder of pictures and captions issued by the Dutch Defence Intelligence and Security Service. General Onno Eichelsheim, the defence intelligence chief, also provided a briefing to accompany the dossier. The US criminal charge against the Russian agents is not espionage, which is reportedly their job, but their job tools — wire fraud, identity theft, money laundering, conspiracy. The “victims” reported in the US indictment are government organizations and intergovernment agencies which have been running public campaigns and sanctions against Russian organizations; most of them involving doping in Olympic sports and World Cup football. The US prosecutors report the Russian motives for the GRU operations to include efforts to “undermine, retaliate against or otherwise de-legitimize the efforts” of the anti-Russian campaigns of the “victims”. 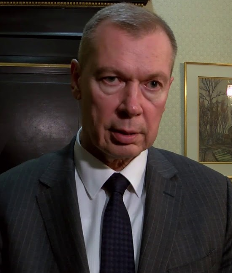 Although the US indictment has added a description of the OPCW operation, it alleges no Russian motive, and issues no criminal charge for what the four Russians had done before their arrest on April 13. If state espionage requires a motive, the October 4 presentation by Dutch officials was ambiguous. 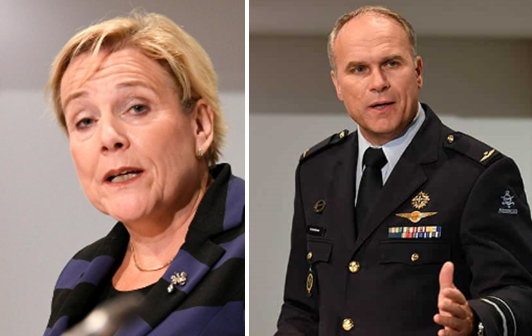 The Dutch Minister of Defence Ank Bijleveld announced the obvious: “let me reiterate what the Dutch authorities have said before, namely that all organisations involved in the MH17 investigation …have long been aware of the Russian intelligence services’ interest in this investigation and have implemented appropriate measures.” General Eichelsheim, head of the Dutch military intelligence agency, claimed the Russian operation intended “digital manipulation and sabotage” of the OPCW. The week before the Russian team arrived at The Hague, Russia’s representative to the OPCW, Alexander Shulgin (right) , supported by several other state delegates at the OPCW, had charged the British and Americans, and also the OPCW secretariat, of sabotage of the organization’s charter, especially Articles VIII and IX. These set the rules and procedures for investigating allegations of chemical warfare by one state against another. The secretariat, run by a Turkish diplomat who previously ran NATO operations in Syria and Ukraine, was also accused of illegally keeping the investigation of the Skripal case secret from the Russian representative and other OPCW members. Voting on this “sabotage” occurred at the OPCW session on April 4; the Russian team now publicly charged with trying to open this secret arrived one week later, on April 11. For details of the earlier story, read this. Left, Ank Bijleveld, Dutch Minister of Defence; right, General Onno Eichelsheim head of the Dutch Defence Intelligence and Security Service.